2 things make my knees wobble these days. Monica Bellucci and Battery Powered DACs. "Hi yeo, Can I come over your place to listen to your battery powered DAC..."
Battery Powered DACs... Ahh.... Like Monica, How can anyone resist? It makes lots of sense to battery power your DAC. Think of your signal chain. First you get digital ones-zeroes-ones-zeroes from reading the CD, then this digital information is fed to various processing IC till it finally reaches your Digital Analog Converter IC. It is from here that you finally get your analog signal, which is then fed to the preamp, power amp and so on. Batteries, by virtue of it already being a constant DC voltage, should be a perfect power source right? Err, not quite actually. Read on. Nothing much here. Just a CS8412 digital receiver, one TDA1543 and attendant circuitry. Big caps are propypropylene 1.8uF. Very simple isn't it? By the way, the plastic box is so easy to use. The burrs can't hurt you! If it did, maybe you should consider changing your hobby to origami? Once we don't have to worry about the power supply, it's easy to try out more DAC chips. DAC Fetish!!!!! Here's a different version using TDA1545. Here's the schematic. TDA1545 (and TDA1545A) accepts only EIAJ input format (I learned this the hard way), and not I2S so CS8412 needs to be configured to output EIAJ. CS8412 datasheet says it needs to be configured for Mode 5, thus only M2 and M0 are tied to 5V. The string of diodes is to give 2/3*Vcc reference to L/R output and Reference pin. Idea given by Thorsten Loesch on diyaudio.com/forums. You could use 3 pcs of AA cells as well, if you wish. As you can see, I got lazy in the power supply department, and forgo the usage of shunt regulators like TL431. Hey, at least I used an inductor okay? Please note that M2 and M0 are tied to VD+ and not VA+. Err, I just remembered I didn't mention anything about the sonics of battery power. Well, apart from the OBVIOUS lower noise floor, music flows easier, more relaxed, more natural. One of the biggest benefits of battery power is a smoooooooth mids+highs, so distinct that whenever you listen to conventional AC-DC powered DACs, you'll have "HARSH HIGHS" written all over the place (your friends' place). But you could easily screw up! One of the DACs I built, I forgot to wire in a capacitor before the regulators. If you look at the schematic, that's the capacitor just closest to the battery. Without this battery, I get a slight veil, particularly noticeable in the midrange. With this cap in, the veil is gone! But why oh why? Aren't batteries perfect DC voltage sources? Apparently, at static conditions, batteries are perfect but music is ANYTHING but static! Under dynamic conditions, probably chemical reaction inside the battery isn't fast enough to cope. This plot here, by DIYer ALW, is very interesting. 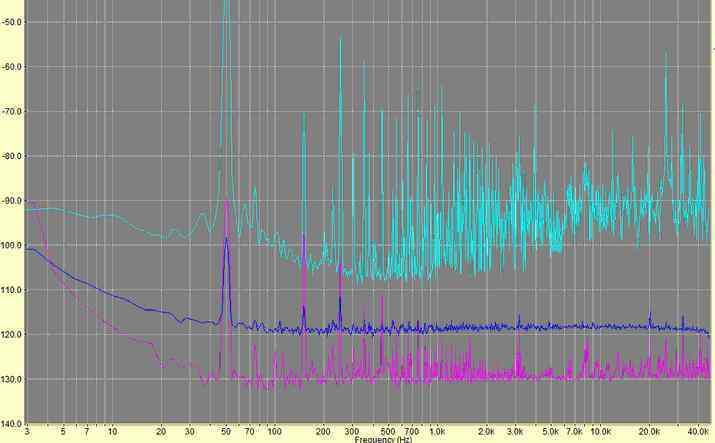 The pink trace is the noise spectra of an unloaded battery. The blue trace is the noise spectra of discrete low noise regulator. Indeed battery is better! But when there is a load of 35mA, see the cyan trace! Now the battery is worse than the regulator! Click on the plot to read the excellent TNT article on regulators. Oh well, I guess battery + caps + regulator will have better noise plot? Aside from the common "darkness" associated with non-os DAC, here's a (very) brief summary of general impressions. All these with batteries of course. Single TDA1543 - Good midrange. Good highs but lumpy bass. 8x TDA1543 - Midrange loses out to Single 1543. Midrange has less prescence. But highs and bass better than single 1543. 1x TDA1545 - Best Midrange here. Best overall sonic. Makes you scream "Mama Mia"! And this is the DAC I'm going to share with Monica Bellucci. PS: If you have two left thumbs, but still want to have a taste of... "mama mia", contact me.